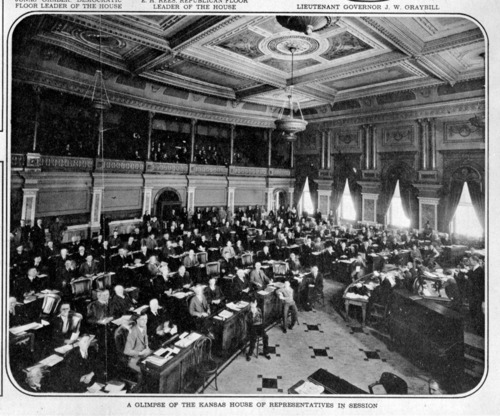 This black and white photograph, copied from The Kansas City Star newspaper, shows the House of Representatives in session. The chamber was built in 1879 as part of the west wing of the capitol. It features plaster columns with a pink marble appearance and twenty-four karat gold leaf trim. The ceiling of the house features four allegorical paintings trimmed in a twenty-four karat gold leaf border. Today, 125 members occupy this chamber when the legislature is in session.